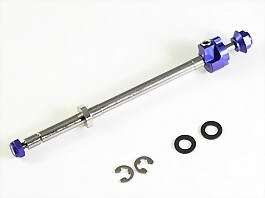 The QTEQ differential shaft is made out of High Grade Titanium and is ideal for those who like to use stock gear differentials in their race car. Our Titanium Shaft is lighter and stronger than the stock shaft made of steel. Although the stock gear differentials of the Mini-Z tend to draw less attention from the users, they have significant advantages such as a good head turning when the car approaches a corner, good pick-up due to low gyrating mass, are maintenance-free, feature no slip losses as it is often seen in a ball differential unit, and setup can be replicated easily if they are functioning properly. 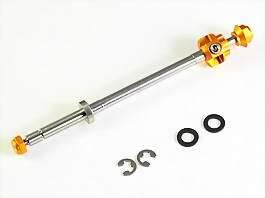 The QTEQ Mini-Z 2WD (LM) Gear Differential Titanium Shaft draws the best out of the Mini-Z gear differential. 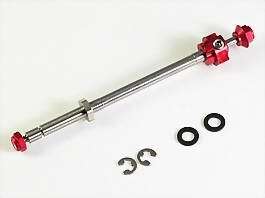 In addition, the shaft can underpin the fact that users may be able to drive the Mini-Z faster than the one with a ball differential. 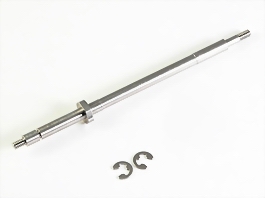 Clearances of all shaft parts are minimized due to our precision machining. Consequently, placement accuracy of the gear differential unit becomes higher and this guarantees gear engagement will be more precise and reduce right wheel play. As a result, these features reduce the differences between right and left hand cornering characteristics, minimizing gear unit wear. The tough and lightweight 64 titanium shaft guarantees that is the ultra lightweight differential unit. 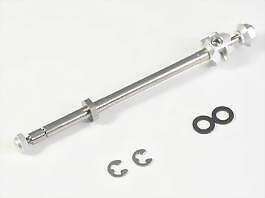 Set of the QTEQ Mini-Z 2WD (LM) Gear Differential Titanium Shaft and QTEQ Clevises. As the QTEQ Clevises secure the Mini-Z wheels very firmly while at the same time maintaining high rotational wheel accuracy, this set enhances both the Mini-Z running performance and maintainability together with the titanium axle shaft.